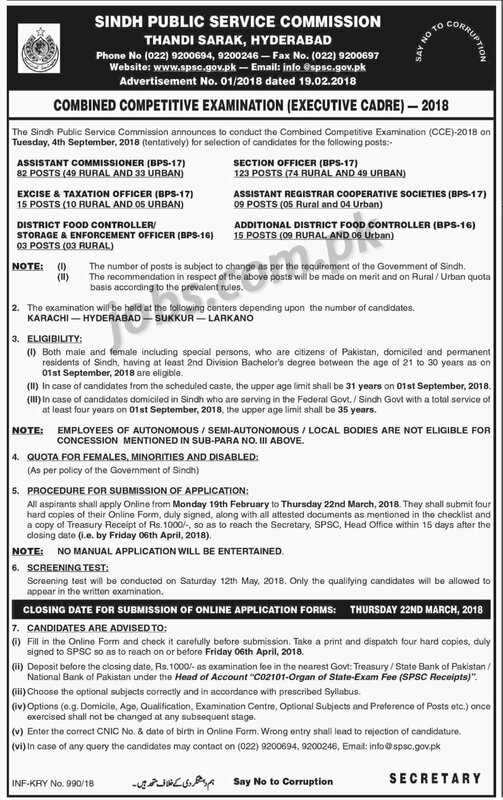 Sindh Public Service Commission (SPSC) Jobs 2018: SPSC has announced to conduct Combined Competitive Examination (CCE) 2018 on 4th September 2018 for the following posts including Assistant Commissioners, Excise & Taxation Officers, District Food Controllers / Storage & Enforcement Officers, Section Officers, Assistant Registrars Cooperative Societies and Additional District Food Controllers to be held in Karachi, Hyderabad, Sukkur & Larkano. Required qualification from a recognized institution, relevant work experience and age limit requirement are as following. Eligible candidates are encouraged to apply to the post in prescribed manner. Incomplete, late, hand written submissions/applications will not be entertained. Only shortlisted candidates will be called for written test/interview. See the notification below to see vacancies/positions available, eligibility criteria and other requirements. Eligible candidates must submit applications on or before 22nd March 2018. 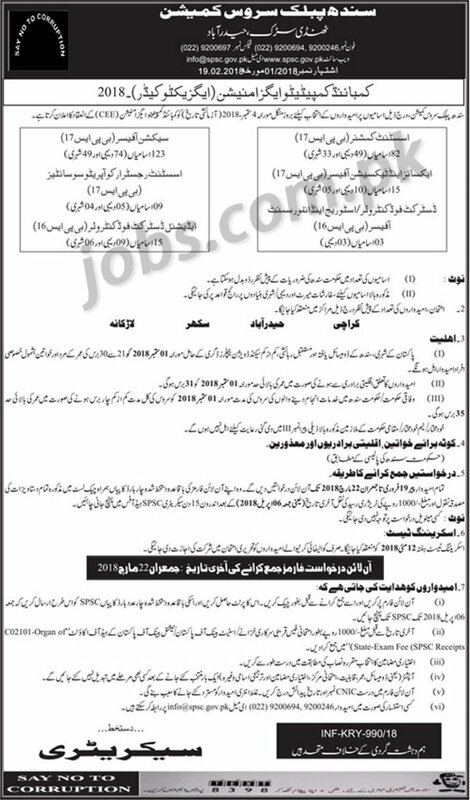 Interested applicants must apply online on SPSC website available at spsc.gov.pk – For complete instructions, please see the job notification given above.